/ctf/api/main/css-customization Retrieves all the CSS customizations. /ctf/js/modules/customization-<customization-name>/<resource-name> Resolves the resource relative to the main folder configured for the given customization name. Here's a sample customization jar file. CTF-Customizations-Enabled The entry to enable or disable a customization. This entry applies to custom event and customizations. CTF-Customization-Name The entry to set the name of the customization to be used for getting bundles. CTF-Customizations-Priority The entry to set the priority for customizations. Allows you to specify the 'priority' of the customization. Customizations are sorted by the servlets based on the 'priority'. Customizations with low priority are included at the end. The priority value could be from 1 to 100, 100 being the default value. CTF-CSS-Customization Path to CSS stylesheet. 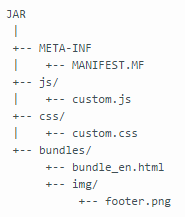 CTF-Bundle-Customization Path to the main bundles directory.